This looping animation shows a computer simulation of the totally eclipsed supermoon’s passage through the Earth’s shadow at 10-minute intervals on the morning of Monday, 28 September as seen from the heart of the UK (the event occurs in the late evening of Sunday, 27 September in the Americas). The first sign of the Earth’s deep shadow (umbra) on the eastern limb of the Moon occurs about 2:07am BST. Full Moon (mid-eclipse) is at 3:50am BST and the last vestiges of the Earth’s umbra slides off the Moon’s western limb at 5:27am BST. AN animation by Ade Ashford. While you probably don’t relish the prospect of waking up in the small hours of most Monday mornings, you will want to set your alarm for 2am BST on Monday, 28 September for this month’s showstopper celestial event — a total eclipse of the Moon visible in its entirety (weather permitting) from the British Isles! Furthermore, this is no ordinary total lunar eclipse — it’s a supermoon eclipse — one that occurs just an hour after the Moon passes closest to Earth in its elliptical orbit (termed perigee), so the lunar orb will appear almost 8 percent larger than an average full Moon. The Moon will be plunged into densest part of the Earth’s shadow (the umbra) for 1 hour and 12 minutes. How rare is a supermoon total lunar eclipse? Total lunar eclipses that coincide with a supermoon are quite rare. Since 1900, there have been just five — on 17 November 1910, 27 November 1928, 8 December 1946, 19 December 1964 and 30 December 1982 (all dates UT). If you get clouded out for this month’s totally eclipsed supermoon, then you will have to wait until 8 October 2033 for the next! The last time that the full Moon slipped into the Earth’s shadow was on 4 April this year. That was a very short-lived total lunar eclipse; totality was just four minutes long (though some authorities now believe that it was technically a partial eclipse owing to a new calculation downsizing the diameter of the Earth’s shadow) and the spectacle was best seen from the Antipodes. April’s eclipsed Moon was also particularly small (diameter 29.7 arcminutes, geocentric) since it occurred 3 days after the Moon was furthest from the Earth in its orbit (termed apogee). The circumstances of the 28 September total lunar eclipse could scarcely be more different! Not only will the full Moon reside in the constellation Pisces this time — almost the exact opposite side of the sky to April’s lunar eclipse in Virgo — but the close proximity and hence unusually large size of this full Moon (diameter 33.5 arcminutes, geocentric) means that it will be almost 13 percent larger than it was at the previous eclipse. 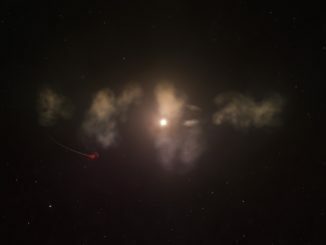 The event will be visible in its entirety (including penumbral phases) from West Africa, the Netherlands, Belgium, France, the British Isles, Spain, Portugal, Iceland and Greenland on the morning of Monday, 28 September. By 2:50am BST on 28 September, the Moon will be half immersed in the Earth’s umbral shadow and the Moon will be some 30° high in the southwest for observers in the centre of the British Isles. AN graphic by Ade Ashford. Most observers will not notice the penumbral stages of the eclipse, but the first indication of the Moon entering the densest part of the Earth’s shadow (the umbra) will occur around 2:10am BST (01:10 UT) when the Moon’s upper-left limb will appear darker. By 2:50am BST (01:50 UT), the Moon will be half immersed in the umbra. Full (super)Moon occurs at 3:50am BST on Monday, 28 September when the distance between the Earth and its natural satellite is a ‘close’ 221,754 miles (356,879 kilometres), making the Moon appear nearly 8 percent larger than average. It is at this time that the Moon should assume a lovely coppery colour due to sunlight refracted by the Earth’s atmosphere onto the lunar surface. 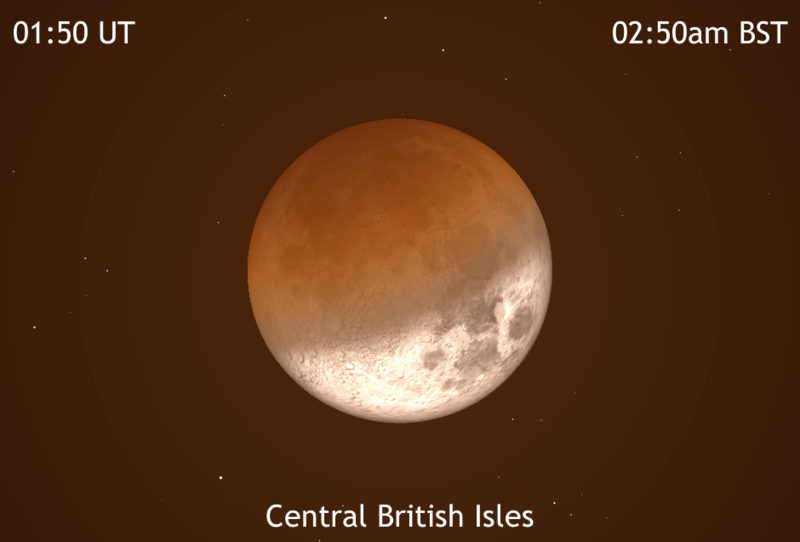 At this mid-eclipse stage, the Moon will be 25° high in the southwest as seen from the centre of the British Isles. AN graphic by Ade Ashford. Totality — when the Moon is fully immersed in Earth’s umbral shadow — comes at 3:11am BST (02:11 UT) and greatest eclipse arrives at 3:47am BST (02:47 UT) when the Moon should take on a glorious coppery hue. Before long, the left limb of the Moon will grow in brightness as the Moon slowly glides out of the umbral shadow and totality ends at 4:23am BST (03:23 UT). 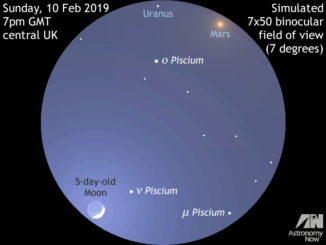 As the Moon’s orbital motion carries it out of the Earth’s shadow once totality has ended, the Moon will appear half immersed in the umbra at 4:50am BST (03:50 UT). 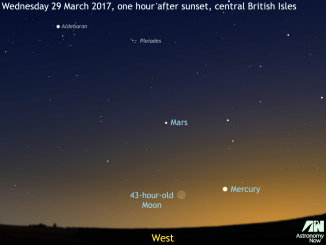 At this time it will be just 20° high in the west-southwest for observers in the centre of the British Isles where dawn astronomical twilight will start in 15 minutes. AN graphic by Ade Ashford. 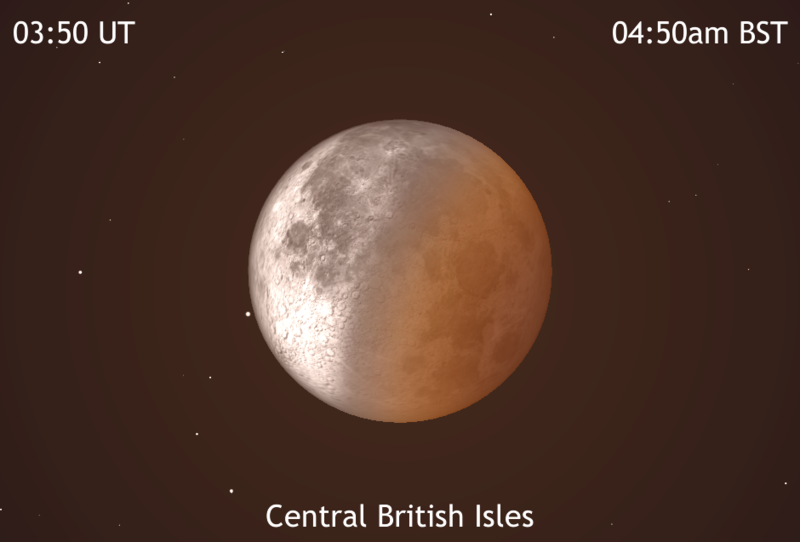 The final stages of this hopefully memorable total lunar eclipse are played out in deep twilight for UK observers as the Moon extricates itself from the Earth’s umbral shadow at 5:27am BST (04:27 UT) and will be 14° above the west-southwest horizon for observers in the centre of the British Isles. If we head west across the Atlantic, almost anyone living east of a line drawn between Lake Winnipeg and mid-Texas will also see the entirety of the eclipse (including penumbral shadow phases), late into the evening and night of Sunday, 27 September. South America has the best view of all, with the full Moon overhead at mid-eclipse just northeast of Brazil. Can I see the eclipse from where I live? It is sadly inevitable that overcast skies will spoil parts of this special event for some of you, but don’t despair if you’re clouded out — you can watch NASA’s live stream online here! Coverage will be from 1am BST until at least 4:30am BST (00:00—03:30 UT) on 28 September (8pm—11:30pm EDT on 27 September) broadcast from Marshall Space Flight Center in Huntsville, Alabama, with a live feed from the Griffith Observatory, Los Angeles, California. 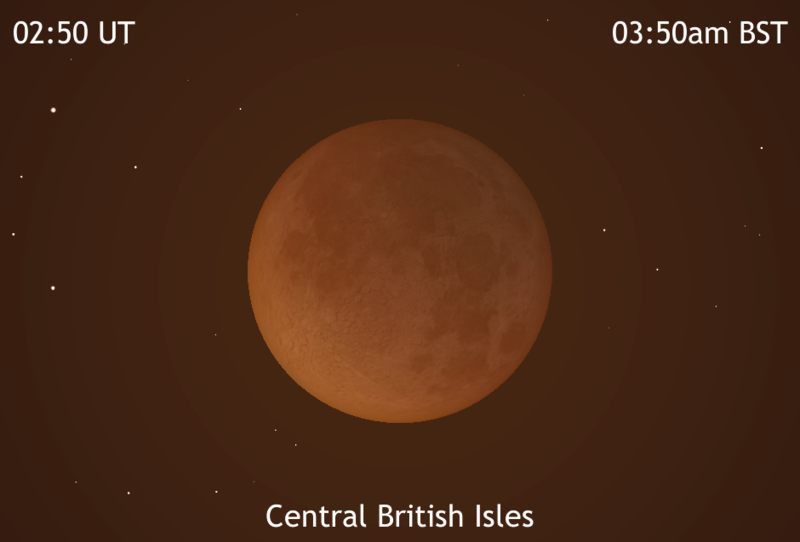 Observers in the British Isles have to wait until the morning of Monday, 21 January 2019 for the next ‘normal’ total lunar eclipse visible from these shores. You can find out more about observing this special total lunar eclipse in the September edition of Astronomy Now in addition to a full guide to the night sky.